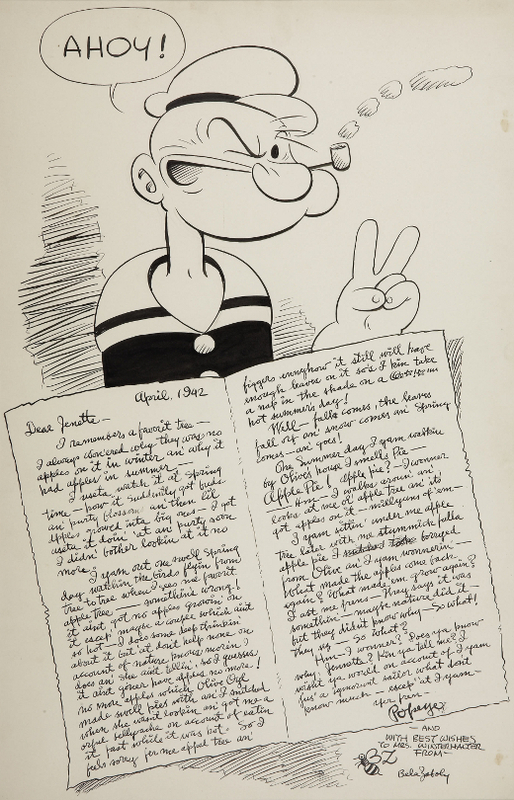 Here's an utterly charming letter from Popeye in which he ponders an apple tree's life cycle, written and drawn by Bill Zaboly in 1942. Zaboly was one of the artists responsible for the comic strip following Elzie Segar's death in 1938 and lovingly produced this piece for a fan by the name of Jennette Winterhalter. Reading the letter in Popeye's accent is advised. I useta watch it at Spring time—how it suddenly got buds an' purty blossoms an' then lil apples growed inta big ones—I got useta it doin' 'at an' purty soon I didn' bother lookin' at it no more. I yam out one swell spring day watchin the birds flyin from tree to tree when I sees me favorit apple tree—somethin's wrong! It aint got no apples growin' on it escep' maybe a couple which ain't so hot—I does some deep thinkin' about it but 'at don't help none on account of nature knows more'n I does an' she ain't tellin', so I guesses it aint go'ner have apples no more! No more apples which Olive Oyl made swell pies with an' I snitched when she wasn't lookin an' got me a orful bellyache on account of eatin it fast while it was hot. So I feels sorry fer me appel tree an' figgers ennyhow it still will have enough leaves on it so's I kin take a nap in the shade on a @☆!☆in hot Summer's day! Well—fall comes, the leaves fall orf an' snow comes an' spring comes—an' goes! I yam sittin' under me apple tree later with me stummick fulla apple pie I snitched took borryed from Olive an' I yam wonnerin'—What made the apples come back again? What made 'em grow again? I ast me frens—they says it was somethin'—maybe nature did it—but they didn't know why—So what! they sez—So what?